Seattle Black Lives Matter Organizers: “We are in full support” of the Seattle educator strike! 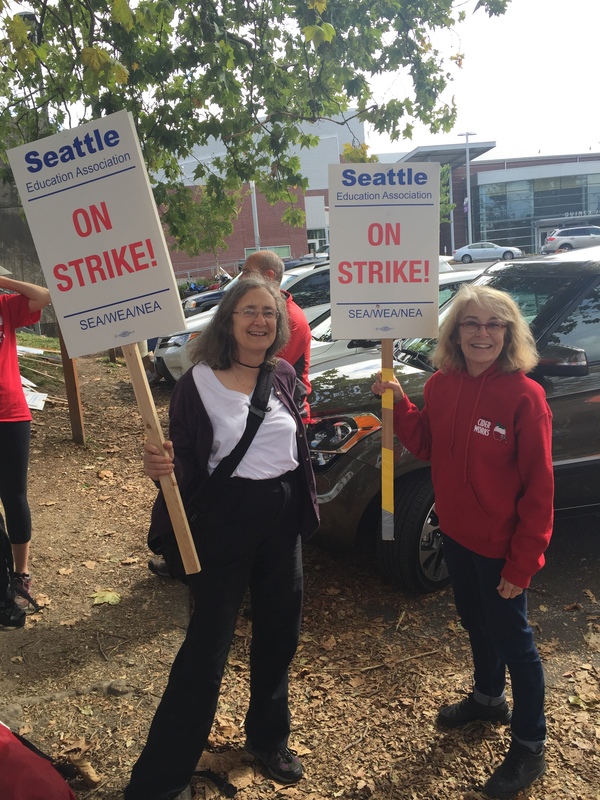 The 5,000 members of the Seattle Education Association led a five-day strike that was nothing short of transformative of our education system and our city. Thousands of parents joined in solidarity with the teachers, including the celebrated “Soup for Teachers” group that formed to bring sustenance and solidarity to picket lines at just about every school in the district. The Coalition for the Schools Seattle Deserves united community organizations and joined Kimya Dawson to host a benefit concert to raise funds for the striking teachers. The Seattle City Council, led by councilmember Kshama Sawant, passed a unanimous resolution in support of the strike. Marching band students used their pep-band anthems to root on striking educators. There can be no doubt that this strike was overwhelming supported by the people in the Seattle area–except, perhaps, for the regions’ wealthiest resident, Bill Gates, who has invested his fortune in schemes to privatize education and reduce our schools to test prep centers. So many of the union’s social justice demands were advanced in the current strike and negotiations–creating a compelling model for educators around the country who believe in social movement unionism. This is why so many were greatly frustrated that the union ended the strike before a fair workload and pay agreement could be reached between the union and the school district. Parents join the picket line! Still, the union’s demand for “race and equity” teams was groundbreaking. 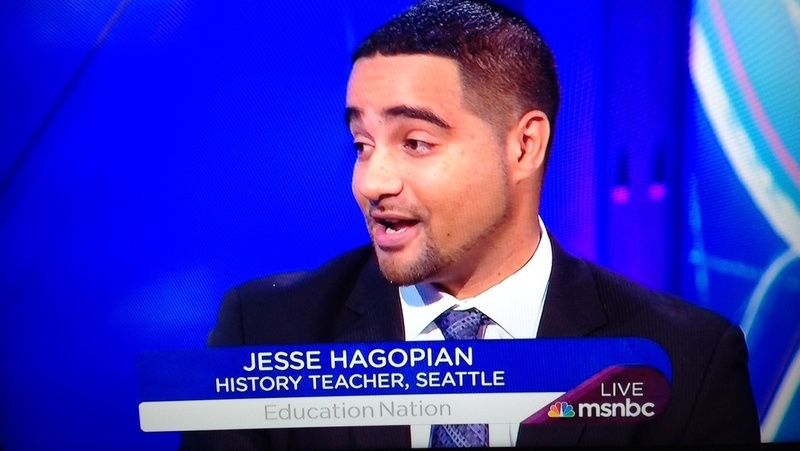 The Seattle Education Association advocated for every one of the Seattle Public Schools to have such a team to tackle issues of institutional racism. The Seattle school district originally said they would only agree to having these teams in six schools. However, the power of the strike pushed the district to agree to allow 30 schools to have these anti-racist committees in the tentative agreement that was reached between the union and the Seattle Public Schools. Given that the Seattle schools have been found to suspend African American students at four times the rate of white students, it is clear that every school in the city needs to take to organize actively against inequality and racism. Tomorrow, Seattle educators will vote on the tentative agreement. Many of us will ask the union leadership why they never organized a mass rally of all our members and our parent supporters to give the bargaining team the support they may have needed to get the very best possible contact. Many of us will continue to push the union stand up and advocate for the planning time and pay that Seattle’s educators deserve–something that was not achieved in the current tentative agreement. But all of us will be proud that our union stood up for racial justice as a critical component to education and any contract that truly values students. Below is a stunning statement issued by many Seattle area Black Lives Matter organizers in support of the striking educators. Our movement has clear lesson: The power of labor, fused with movements for Black liberation, can even defeat the will of the nation’s billionaires. 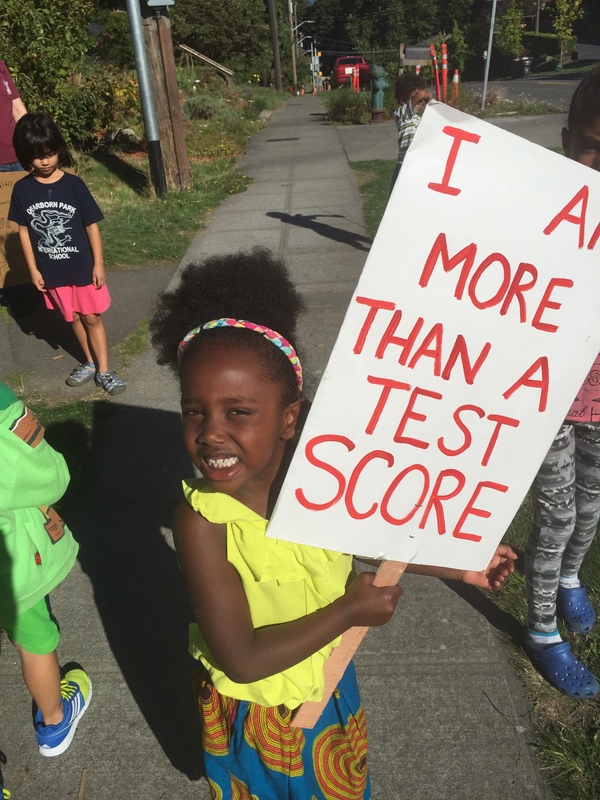 Seattle, WA— September 15, 2015 — September 9th, 2015, the first day of School, Seattle Educators went on strike demanding the District provide a contract settlement that guaranteed student recess, professional pay, fair teacher and staff evaluations, reasonable testing, ESA workload relief, office professional workload relief, and student equity around discipline and the opportunity gap. The District is comprised of over 53,000 students. In 2013 black students represented just over 20% of the 12,500 high schools students in the Seattle district and 18% of the 8,000 middle school students, but accounted for over 40% of all suspensions and expulsions in those schools. This is not new information. In fact, the school district has been under federal investigation by the Department of Justice for disproportional and disparate school exclusion practices. Seattle Black Lives Matter Organizers and Activists stand in solidarity with Seattle Educators because our fight for Black Liberation is intertwined with the Educator’s fight for equitable education and opportunity for all students. We are in full support of the demands made by the Seattle Education Association. In particular, we highlight those demands which most impact student equity and the opportunity gap. SEA has requested the School District put “Racial Equity Teams” in all 100 Seattle Public Schools to ensure that our black and brown children no longer fall victim to the “School to Prison Pipeline” and the opportunity gap. The District initially agreed to only provide six teams to six schools; which represents only 6% of a district under federal investigation for racially biased school exclusion practices. Furthermore, the SEA has requested that any standardized test above the federal mandate be discussed with SEA prior to implementation. Presently, students between K to 12th grade could be subjected to upwards of 65 standardized tests. Children as young as Kindergarten are required to take standardized tests to determine their eligibility for Spectrum and Advanced Placement Programs. These tests are becoming increasingly computerized. Therein, those children with access to computers are more likely to do better on computerized standardized tests than those students who do not have access to similar technology. Furthermore, those tests which determine a student’s eligibility for graduation prevents many students from graduating. The students negatively impacted by these tests are increasingly black or brown and/or socio-economically disadvantaged. Those students who can financially afford additional tutoring and access to resources are more likely to pass standardized tests. Also, there are inequities in network serving capacity and the availability of computers from school to school. Generally schools attended by students of color have slower networks and less access to computers taking away time from teaching and learning. Therein, standardized testing and inequitable access to technology in the Seattle Public Schools District contributes to school segregation, the widening opportunity gap, the “School to Prison Pipeline,” institutional racism, and maintains the myth of white supremacy. 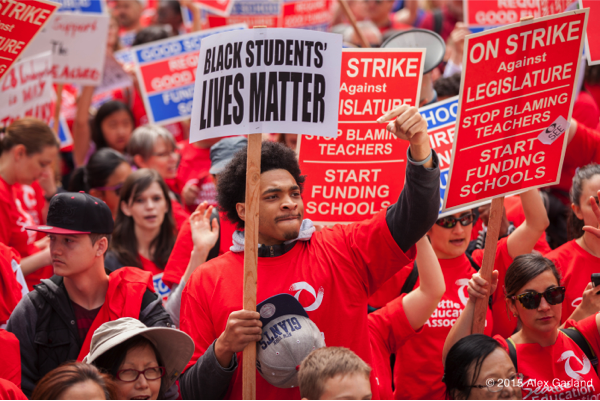 Bobby Seale said, “You do not fight racism with racism, the best way to fight racism is with solidarity.” We, Seattle Black Lives Matter Organizers and Activists, stand in solidarity with the Seattle Teachers’ Strike. We know that there are many institutions in the United States and all of them are have been birthed from the same system—a system, which since the inception of this country, has valued black lives as little more than property. We recognize that education is an institution of socialization in the United States. It is essential for Black Liberation that the institution of Education be challenged and rebuilt in a manner that is decolonized, equitable, and believes that Black Lives Matter. Therein, we stand in solidarity with Seattle Teachers who not only seek equitable pay and fair treatment of their time in the classroom, but who have also taken a stand against racism and anti-blackness in Seattle Public Schools. We will republish the statement as new signees join. And of course the Chicago Dyett Global Leadership & Green Technology High School – Hunger Strike which focuses on an outstanding curriculum and community input.